TAKEN ON 3rd OCTOBER 2008 BY ONE OF OUR CONTRIBUTORS. BROOKFIELD ROAD 10/02/2018 Have just come across your website and it brought back many memories of living in Brookfields. My grandparents, Fred and Ethel Hardy, lived at 8 Brookfields Road, which is one of the houses still currently standing. I think they moved into the house in the 1920's or early 1930's, and my grandmother was still there until the time the residents were told the houses were going to be demolished, my grandfather having died in Dudley Road hospital in 1970. The houses had an alleyway running at the back, which was pitch black, and friends and family always used the back door, never the front. The houses were 3 stories, with a coal cellar, scullery and outside loo. Looking at the photos of the houses I can see the window of my bedroom right at the top of the house. Two doors to the right of my grandparent's house lived "Uncle" Brian and "Aunty" Mary. They gave me my book of Common Prayer which I still have 50+ years later. I remember a boy called John and his sister Pat ??Gregory?? lived the other side of my grandparents. My mother and I lived with my grandparents from around 1960 to c1964 and I attend All Saints School and Church. I remember little about the school, apart from the fact that it always seemed cold even in the summer and when I was about 6 some of my class, including me, were tested for the ability to read phonetic passages. My grandfather worked at a engineering factory as a caretaker and I used to go with him some weekends while he checked the building. On one occasion he just managed to stop me putting my hand in a vat of acid!! I thought it was just clear water. I remember the "outdoor" on Crabtree Road where my grandfather would send me with a bag containing 2 bottles to be filled with draft beer. Further down was the "chippy" where the kids could get bags of "scratchings" which were all the bits of batter and chips and we would hang around the closed up shop on the corner of Brookfields. There was a little shop on the left hand side of Crabtree Road that used to split loaves of bread in half and sell cigarettes from the packet. I was often sent with the shopping list wrapped around the money. And I seem to remember an ironmongers, or similar, at the end of the alleyway and the name Gucks. There was also a pub on Crabtree Road where the kids would sit on the step with a bottle of pop and packet of crisps, and would never be allowed inside. Further up Crabtree Road was the old R White pop factory. At the top of Brookfields Road, on the left, was a working yard that had some old vehicles in the corner which we used to make dens. From there was a bridge over the canal and we spent hours on the towpaths there by the hospitals. Opposite the yard was the warehouse where we also played until we were "politely" told to go away. It later became a factory where by bizarre coincidence my step-father, who did not come into our lives until years after we had left Brookfields, was killed in an industrial accident around 1973/1974. It is amazing how the views and prejudices of the older generation filter down. A few years after we left Brookfields I was visiting my grandparents when I fell in the back yard and broke my elbow. I would not let my grandmother take me to Dudley Road hospital because of the reputation it had that, if you went in there you did not come out. I was in agony for two days until I was taken to Selly Oak hospital near to where we lived at the time. A picture of my cousin Alan Aston, in a cowboy outfit, bought back from the USA in about 1953 or 1954, after his mother, my Aunt Gert made a visit to her brother who had emigrated there. The outfit is typical of the sort play garment popular with young boys at the time. No Star Wars here! A picture of my mom, Frances Elizabeth Aston (Giles) in the back yard of 2 Highfield Terrace, Brookfield Road. 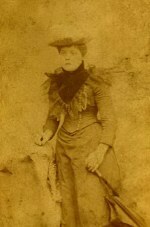 The 'pinnie' - pinafore, she is wearing, is a typical garment of the time, worn over a dress or similar, to protect the dress whilst doing household chores. This photo was taken in about 1952. My mother, like most women of the period, was a housewife at the time. What a pleasant surprise to find, whilst browsing the web, a site specifically for Brookfields, and a similar one for Winson Green. Both districts of Birmingham that figured largely in my formative years. My immediate family and I lived in Brookfeld Road. 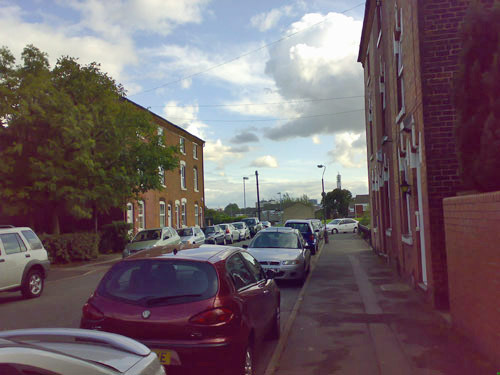 We had a large extended family who lived around us, and on my mother's side, in and around Peel Street, and latterly Barford Road, both of which are in Winson Green. I was christened Keith Aston, although since secondary schooldays, everyone has called me Ken. I was born at 2 Highfield Terrace Brookfield Road, in 1950, where I lived with Mom and Dad plus three older sisters - Jean Audrey and Pauline. We moved into number 13 from the terrace, a 'front' house in about 1954. The house is still standing, along with most of the other houses in Brookfield Road, but it has been re numbered 15. The end house of each of the original front terraces, was demolished during a 1980’s refurbishment, to make way for a car park for each enclave of properties. The result is that the terraces are much more open nowadays than they were in the 50’s. Another big difference is the quietness of the area. The factories, with the exception of most of the ones in Great Western Road, are gone and of course, the kids don't play on the street as once they did. There are also fewer kids than there were in the 50’s. so the atmosphere of Brookfield and adjacent roads, is much quieter than I recall. So much for the hectic pace of modern life! We stayed at number 13 until 1963, a time when a lot of the so called 'old' Birmingham communities were being rehoused. I remember the surname of the family who exchanged houses with us was Mariner. They came from Monument Road Ladywood. We were rehoused by the city council to a High rise flat in Highgate. Not a good move, in my opinion, as all the attractions of the old community were gone, to be replaced by the concrete jungle. Ansells outdoor on the corner of New Spring Street and Crabtree/Western Road. Run by Mrs Flynn, from about 1958. I don't recall who ran it before that time. Mrs Flynn’s son Kevin was a mate of mine. He had to spend some time in Switzerland, as he had terrible asthma, which gets me thinking. The air around Brookfields was not good in the 50's. Like most of the other kids of the time, I suffered terrible catarrh, but how come that more people are diagnosed with asthma today, despite the undoubted improved quality of air. Strange! Mr Podmore the butcher. Ran the shop with his wife for the whole period I lived in Brookfield Road. I was his butcher boy for a few months from my 13th birthday - 1963, until we left the area. Wages for two afternoons and a Saturday were £1.50. This compared handsomely with the paper kids wages of 37.5 pence per week. I was lucky to land that job, and sorry to have to give it up. Derek Wilson took over from me when I left. Mr Podmore had worked for Marsh & Baxter (of Brierley Hill) before he went out on his own. Garbutts the greengrocer. Again, they were there all my time in the area. They had as I recall 2 sons, both older than me. The younger boy was named Roger. I can't for the life of me remember the older boy's name. Mr Crutchley. He ran a cobblers shop until a few months before we left in 1963, when he retired. I remember my dad saying at the time that Mr Crutchley had run the same shop since the twenties, so he must have been in his seventies when he packed it in. Strangely, I don't recall Mr Crutchley ageing one bit over the years. He always wore a flat cap, leather apron, and could usually be found humming or whistling a tune to himself. Greenfields chippie. Janet Greenfield was best mates with my youngest sister Pauline. The Greenfields left the area about 1958, after which the chippie was taken over and run by Greeks. Wilkes paper shop. I remember that Mr Wilkes' first name was John. He was bald on top, and had a moustache. For Mrs. Wilkes character, think a younger Annie Walker from Coronation Street! Coopers grocers. I only remember a Mrs Cooper, who ran the shop. There was a son John. In the late 50's, early sixties, the Coopers sold out to a Mr LLoyd, a small man with a moustache. He was running the shop at the time we left. Brookfield Pressed Steel and Metal Works. A converted Victorian chapel next to Lloyds. Like a lot of industry in Birmingham at the time, it was right amongst the living area of Brookfield Road. Mrs. Evans Grocers. Across the road from Coopers, and coming back toward Brookfield Road itself, was Mrs Evans. She ran the shop while Mr Evans, kept the books and ran the house. It worked well for them, as they were still running the same shop when we left the area. My mom used to mind the shop for Mrs Evans when herself, Mr Evans and their only child Mary Mira, went on holiday for a couple of weeks each year. They always went to Portsmouth! Moving swiftly along, back in the direction of Brookfield Road, and opposite New Spring Street, stood Gucks. Mr Guck sold hardware, and in 1959 supplied me via my Dad, with a Runwell two wheeler bike, made as I recall in Tyseley. Mr and Mrs Guck had a son Roger. They like some of the other shopkeepers, did not live above the shop, which was left empty. Moving further along into Western Road, were two other shops each, like Gucks on the right hand side. They were not used the whole time we lived in Brookfields, but I remember that a large family, the Tierneys, lived opposite. For a while, one of the sons ran the shop, as a decorators merchants. I also vaguely recall that the other shop was something like a drapers or needlework shop for a while. To close this section, and speaking of the Tierney’s, does any one recall Pete Tierney and the Nighthawks. Pete, I think was the eldest son. Finally on entering Brookfield Road itself, on the right hand side about two thirds of the way along, was Stanton's. This was a shop converted from someone’s front room, and closed during the late ‘50’s, when Mrs Stanton retired. I can just remember going in there for bits and bobs. My eldest sister Jean spent a lot of time with my Gran during the ‘30’s. Gran Aston lived at 7 Claremont Place until she died aged 92, in 1964. Sister Jean tells me that she remembers as a kid in the 30’s, seeing the Oxo wagon delivering to Stantons. Apparently it was literally a covered wagon, pulled by a large Bullock! My mom and dad lived across the wall from my Gran at number 7 Landsdowne Place. Next door to them was mom’s sister – Aunt Nell and Uncle Herbert (Mogford), whilst on the front at number 36 Brookfield Road, lived Aunty Maud and Uncle Edgar (Powell). With various cousins , uncles aunts etc coming and going, this is what I mean when I refer to a large extended family living in the area at the time! Opposite number 36 was a warehouse for HJ Heinz & Co. of 57 varieties fame. The warehouse was just that, a storage facility. It was busy five and a half days a week, with deliveries etc. The old building was demolished in the late ‘50’s, and replaced by a modern structure. I recall Heinz moved out after 1963, and I think there was an engineering firm who occupied the site before it was demolished. It lay derelict for some years, before being developed for housing. With an arm of the Soho loop Canal adjacent, I can quite imagine how these houses are considered nowadays as ‘waterside residences,’ whereas we would have thought of them as being next to the Cut! It was so nice to read about Brookfields Road, but I noticed an error, my grandmother was Mrs Atkins who owned the drapery shop. Nan did live in Crabtree Road and the drapery shop was also a book exchange, Granddad used to go round on his bike exchanging books and taking orders, Nan only had one leg as the other was lost when she was 2 when she was run over by a horse and cart. Does anyone remember the Wiggins family, we lived at No 11 Highfield Terrace from 1930 until the late 60s There were 6 children, First Harold, then John who married Jane Atkins from the Drapers shop, next was Lewis who now lives in Shard End, he told me about your web site, next was myself Margaret still very much around, then came Alan who has been living in South Africa for 26 years, and is also going to contact you with his memories, last was Marjorie, who lives in Bickenhill,, we all attended All Saints school, and remember Miss Cole very well, I have not seen anyone mention a teacher called Mr J. Roberts, everyone was terrified of him and my brother John taught me a song does anyone recall it. At the time I was born - in Dudley Road Hospital, on 20th July 1935, my parents John and Louisa Wiggins were living at 11, Highfield Terrace, Brookfield Road. We always said our address as 11, Highfield Terrace, because it sounded so much posher than "11 backa 13". Mom, Dad, Harold, John, Lewis, Margaret and me, (Marjorie came later) were all crammed into a 2 up 2 down (+ kitchen), but we did have front and back gardens and our own loo. Our entry consisted of 13 houses and at that time from No. 1 to 13 the occupents were :- No.1 the Nicholls, 2 the Andrews/Astons, 3 the Hawkes/Butlins, 4 the Vaughans. 5 the Barnes/Davis, 6 the Pike/West/Smiths, 7 the Griffiths, 8 the Shiners, 9 the Badgers, 10 the Poutneys, 11 the Wiggins, 12 the Suttons, 13 the Lanes/Taylor's. Just over the wall at our back gate, was a small Chapel, where Spiritualist meetings were held every Sunday morning. You could go and have your fortune told for a small fee. The singing however, was awful!!! Life in the late 30's was pretty hard, but we never went hungry. Dad worked at Bellis & Morcamb in their foundry and Mom was a charlady for our Doctor - Doctor McKernan. However I often ran errands for 1d for the gas meter. When the war started in 1939 I was four and started School at All Saints. The Headmistress was Miss Cole and my first teacher was Miss Orme. The highlight of my time there was taking the Lead part in the School Play about a court jester named Merryheart. Having to sing solo in front of all the parents was a terrifying business. I was in the Church choir for a time, but I fell foul of the Vicar, the Reverend Jackson. He caught me ringing the Church bells and reported me to my Mom, who promptly told him to "bugger off". Then hit me round the ear with a wet floor cloth!! The war was to me pretty exciting. When the bombs started falling, we all retired to our cellar which Dad had reinforced and fitted out with bunk beds. The closest bombs dropped to our house, were in Prescott Street. One outside the Prince George and the other close to Watty Green the Bookmaker's house. I do remember watching the glow in the sky when Bulpits was hit and going out looking for pieces of shrapnel. After All Saints, I went to Handsworth Grammar School, from 1946 to 1951 and was a member of Edge House. The Headmaster was the Rev.J.J. Walton, who loved to use his cane at every opportunity. I was caned four of the best on my backside twice, once for running in the corridor, (mind you, I did run into him!) and once for not doing my homework. During this time I didn't get much time for mates, but my particular friends were Gordon Parsons from No. 5 Brookfields Road and his sister Margaret, George Palin who lived at about No. 8 Brookfield Terrace, Albert Day and Graham Sutton, who taught me how to smoke! As I remember, the surrounding shops, the ones in Crabtree Road opposite Brookfield Road were from right to left :- The Off License, C.V Bull the Butcher, managed by a Mr George Bell, then Wilkes the Greengrocer. Then the Chip Shop, then Crutchley the Cobbler. Then there was a Drapers with a Hairdressers in the back room, then Boyles the News Agent, then Coopers the Grocer, who used to have Wimbush's cream cakes! From Brookfield Road down Crabtree Road were - Evans the Grocer, Atkins the Draper (My brother John married Muriel (Jane) their daughter) Blackhams the Confectioner, Weavers who sold sweets and cigarettes, Parker the Tobaconist. Coming up Crabtree Road, there was a Cafe' then Miss Gazey who sold candles and paraffin, Keedwells Furniture, a Drapery Shop, then the Prince George on the corner. With all those shops on our doorstep, I could never understand why my Mom always shopped on "The Flat"? The trudge back home with bags of spuds and cabbage etc. was an absolute killer! Going to School was an adventure in itself, as often the magnificent Clydesdales which pulled the railway carts, were returning to their stables, which were situated on the corner of Crabtree Road and All Saints Street. The roadway was cobbled and the horses' shoes struck sparks as they scrabbled for grip on the slippery surface. Often they slipped and it was an enormous effort for the handlers to get them to their feet. The horses which pulled the Scribbans Bakery cart however, were entirely different, they were like Hunters and very sedate. Our biggest "dare" was to run under a Scribbans horse! I remember watching those horses being shoed at the Blacksmith in Clissold Passage at the side of the canal and wondering how they managed to do it without hurting the horse. The canal system was our major playground. We rode our bikes along the sloping banks and towpaths for hours on end. We made slides when they froze over and even swam in them in the summer, yuk!! We often "borrowed" coal boats from the boat dock at the end of Brookfield Road and went for joy rides! We were one of the few families who had a car in those days - a Wolsely 9 No. XG 2484. My Dad and my brothers spent more time fixing it, than driving it, but it made a splendid place to act out our imaginary journeys to the seaside and beyond. It was garaged in a lock up, sandwiched between the School and the railway lines. This was the ideal place to trainspot the GWR Engines, even though it was a good distance from the lines. Many a happy hour was spent here trainspotting, as I was the chief bottle of tea fetcher for my Dad and brothers, as they dismantelled the old Wolsely and put it back together every weekend. In my late teens, I played for Brookfields cricket team in the Birmingham Parks League. Our Captain and Manager was Doug Constable, who, with his younger brother Don, were the leading lights in the team. I was the fast bowler, but at 5' 2" I was a bit disadvantaged. I got a lot of wickets though! I stayed in Highfield Terrace until March 1960, when I left home to marry Val (nee' Morris) my wife of nearly 44 years. We left the U.K. with our children Ian, Andrew and Jenny in 1976 and now live in Edenvale in sunny South Africa. Our Daughter Jenny lives with her husband and three children in San Ramon in California. A long way from Brookfields, but the experiences and values learned living there, will never be forgotten. I have just found your web site my parents lived in Brookfield's road from the early sixties to 1970 , my dads name was Terry Harper and mom's Irene (nee Carter) , moms sisters Pat and Maureen also lived in Brookfeilds Road with their husbands Ray and Eddie Jones. My moms mother and father Harry and Elsie Carter also lived in the road , I went to All Saints School, until we moved in 1970. The reason for my contact is, sadly my dad passed away a few days ago at home in Quinton on April 18th 2015, so if anyone remembers him or any other family members I would be interested to hear from you, I live in Western Australia, I'm currently here in Birmingham till after the funeral. What a find. Names come rolling back.I was born at 2 Brookfields Road in 1940.Went to Ellen Street Primary and then Barford Road Secondary. Left in 1959 for Australia. I live in country Victoria. Hope to write more later. Does anybody remember the great street party we had for Queen's Coronation? Money was collected for weeks and although I was only twelve I remember it as a great day.